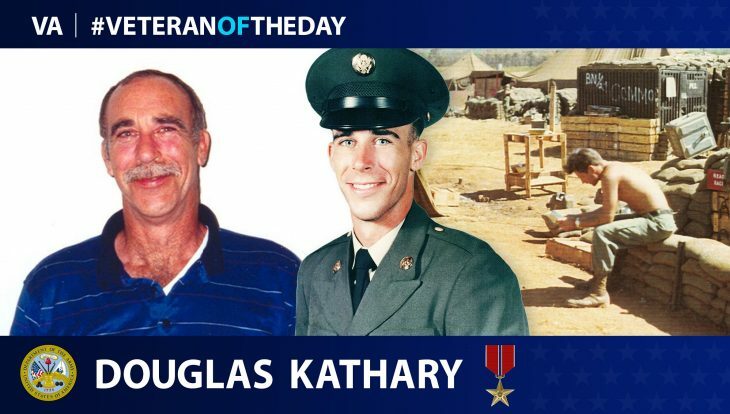 Today’s #VeteranOfTheDay is Army Veteran Douglas “Doug” Kathary. Doug served during the Vietnam War. Doug was drafted into the United States Army in June 1969 at the age of 20. After completing basic training, Doug was assigned as an artillery man and completed artillery school. He went on to volunteer for non-commissioned officer training and achieved the rank of sergeant. He was then sent to Saigon, Vietnam, where he was assigned to D Battery of the 1st Battalion, 8th Artillery Regiment, 25th Infantry Division. Doug and his battery were designated as an Air Mobile Artillery Unit. When a new position for artillery was found, Doug and his battery were airlifted to the location and established a temporary fire support base. They remained in these positions for approximately a month and were responsible for communicating with forward observers in the field to direct artillery fire against enemy positions. One night, while deployed in a fire support base, Doug and his unit were engaged by enemy artillery fire. Doug and his team acted quickly and were the first to fire against the enemy. For this, Doug was presented with his first Bronze Star. He was awarded a second Bronze Star in recognition of his contributions to his fellow soldiers under adverse conditions. Doug was discharged in April 1971 at the rank of sergeant. In addition to the two Bronze Stars, Doug received a Good Conduct Medal and a Meritorious Achievement Award. Upon returning home, Doug resumed his studies under the GI Bill and later started a career working with animals as an instructor at Columbus State Community College. Thank you for your service, Doug! Thank you for your service – Army Veteran Douglas “Doug” Kathary.